I’ve just added a number of prints to my sale page, including this little devil. Click on the link at the top of the page and scroll to the bottom of the listings to see what’s new. We have exposed VICE, and held it up to general contempt wherever we could discover it; and sorry are we to say, that vicious examples in high life have (when by us weighed against those in common society)… made the terms of ‘rich’ and ‘contemptible’, synonymous. This stirring stuff was combined with less controversial pieces on the theatre, books , fashion, London life and numerous amusing anecdotes. 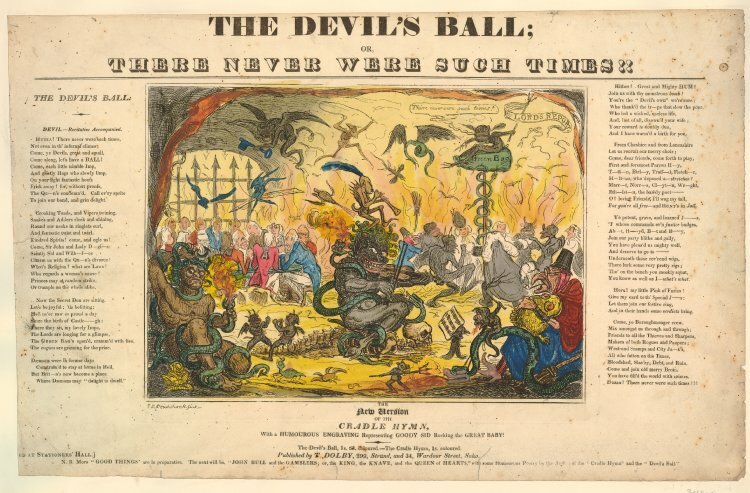 The New Bon Ton took its inspiration from William Naunton Jones’s Scourge; or Monthly expositor, of imposture and folly, which had run from 1811 to 1816 and offered a similar mix of reformist political satire and humorous miscellany. 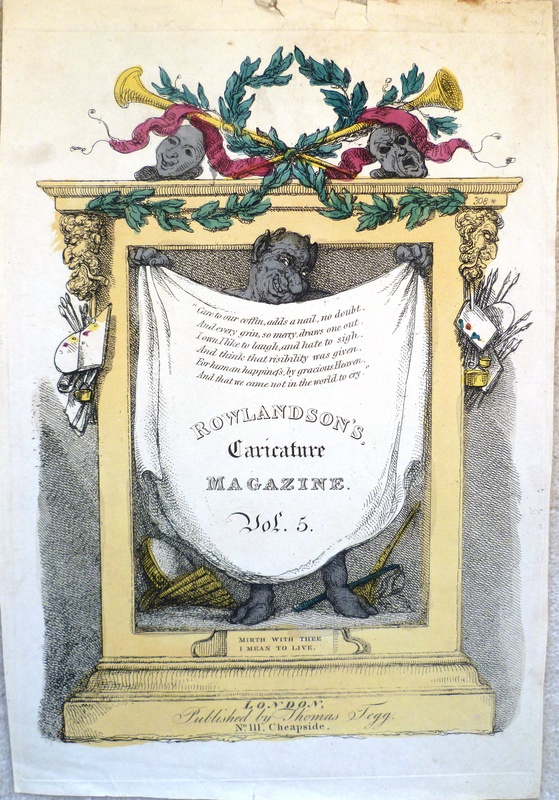 It’s likely that John Johnston had been closely involved in the publication of this earlier journal, having been one of only two official distributors, and was consequently able to employ all the same writers and artists to work on his own publication. 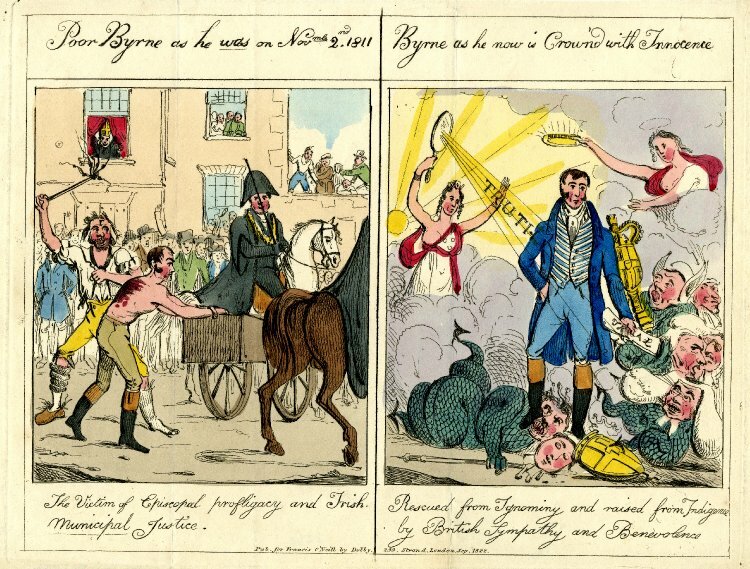 This included the caricaturists George and Robert Cruikshank, Charles Williams and the 22 year old J.L. Marks. A selection of their works for the magazine has been used to illustrate this post. each edition. This was presumably introduced as a cost-cutting measure which reflected the constrained economic circumstances that both the publisher and his potential customers found themselves in during the difficult post-war years. The subject matter of the plates typically reflected the reformist editorial agenda of the magazine and oscillated between attacks on the government and promotion of the reformist agenda. Perhaps the most interesting story connected with the New Bon Ton is that of John Mitford, the jobbing writer and journalist hired to produce most of the magazine’s written content. Mitford came from a respectable Northumbrian family and had served in the Royal Navy for sixteen years prior to taking up his career as a writer. But he was also a man plagued by mental illness and rapidly descending into an full-blown alcoholism. Mitford began his writing career after being discharged from the Royal Navy on health grounds in 1811. 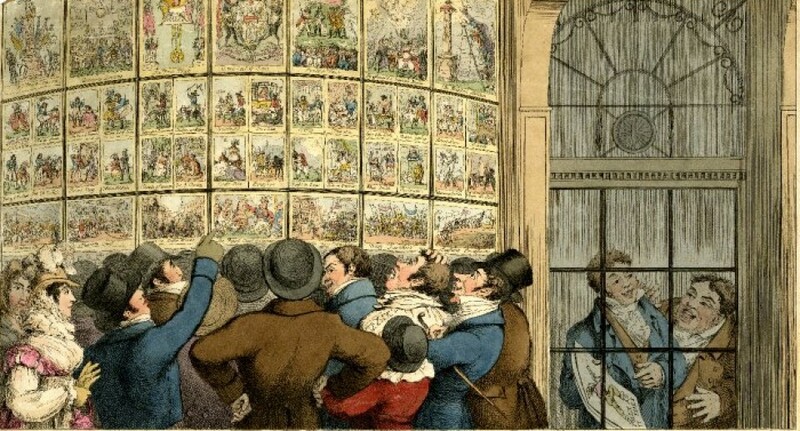 He began writing for Whig and reformist journals and quickly gained a reputation as a man with a talent for humour and a good eye for the satirical. 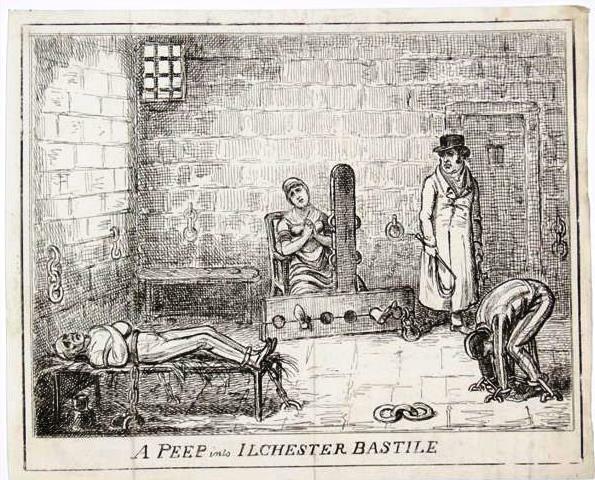 His career ground to a half for two years, between 1812 and 1814, when he was confined to a lunatic asylum following the onset of some acute form of madness. He emerged from hospital in time to begin contributing articles to some of the later editions of the Scourge and to begin work on a book, The Adventures of Johnny Newcome in the Navy, a humorous poem in four cantos accompanied by 16 engraved plates by Thomas Rowlandson which was published in 1818. Taking the piss. I.R. 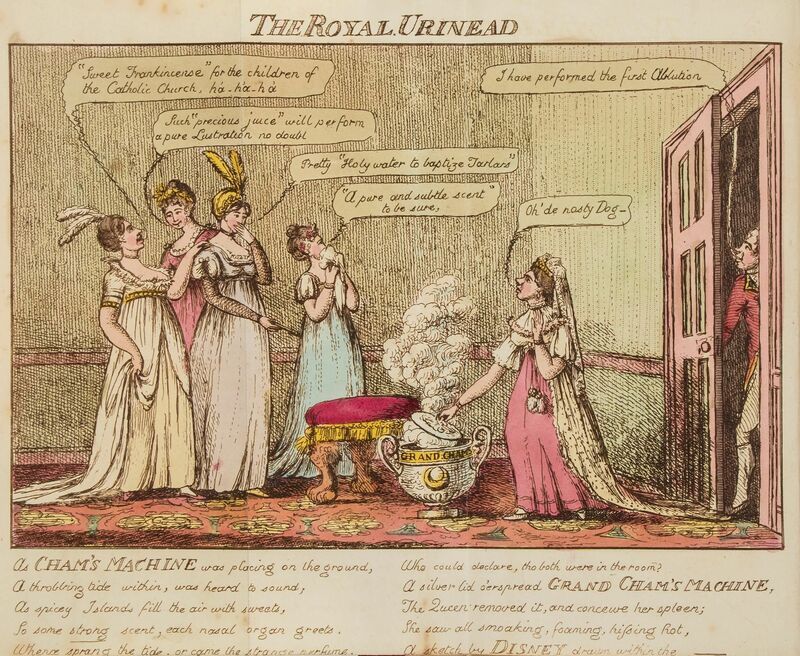 Cruikshank, The Royal Urinead, 1808. 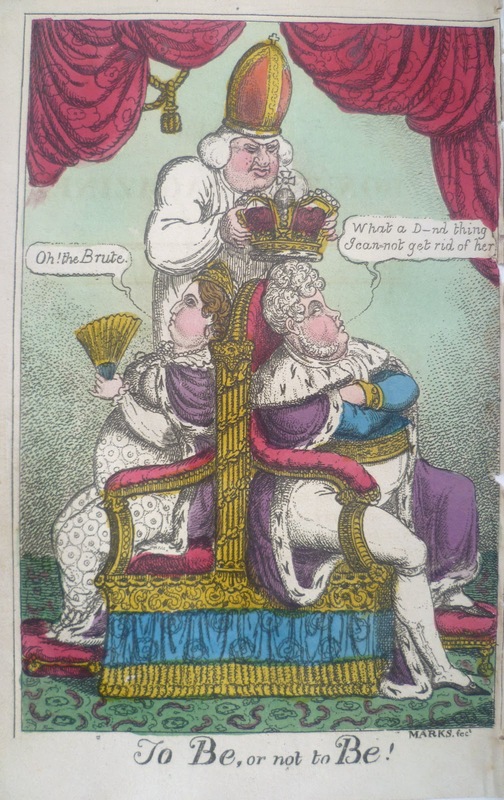 This scurrilous caricature of the royal family was produced by Isaac Robert Cruikshank as a frontispiece to the pamphlet The Royal Urinead in 1808. The publication was considered to be so offensive to the royal dignity that it was banned almost immediately, with copies being bought up or seized by the authorities and destroyed. 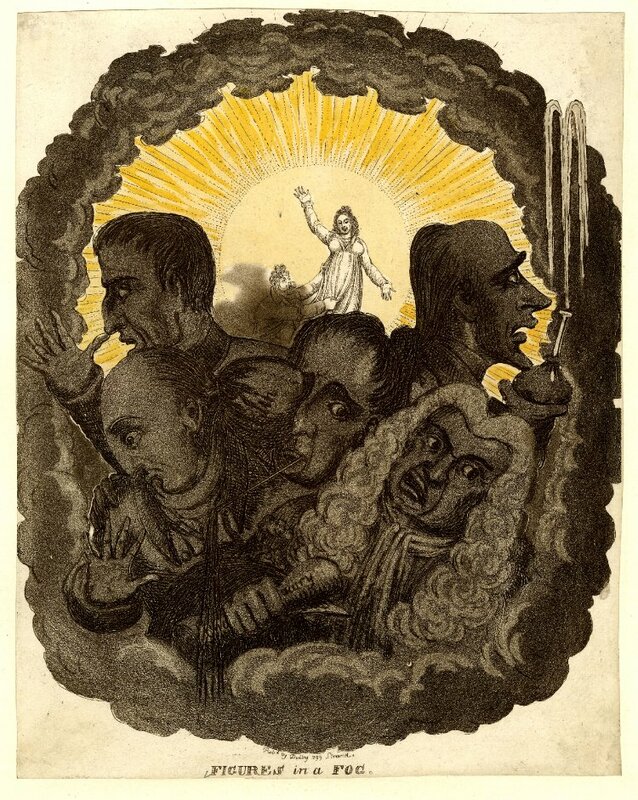 The few editions which managed to evade this government dragnet are now considered to be among the rarest surviving examples of Robert Cruikshank’s work. The story of The Royal Urinead begins with the pamphleteer Thomas Hague, an incorrigible hack who briefly rose to prominence among his fellow scribblers as a result of a seeming desire to wage a one-man war against the British royal family. The opening salvos of this engagement had been fired earlier in 1808, with the publication of Letter to . . . the Duke of York, or an Exposition of the Circumstances that led to the late Appointment of Sir Hew Dalrymple and An Englishman’s Letter to his Majesty, two pamphlets in which Hague pilloried the Duke of York for awarding senior army commissions on the basis of bribes which had been paid to the royal mistress, Mary Ann Clarke. When the Duke of Sussex attempted to intervene and protect his elder brother’s reputation by ensuring these pamphlets were removed from circulation, Hague flew into print again and fired off another pair of intemperate squibs – Traits of all the Royal Dukes and The Royal Urinead – in which he condemned the moral failings and autocratic tendencies of royal brothers. 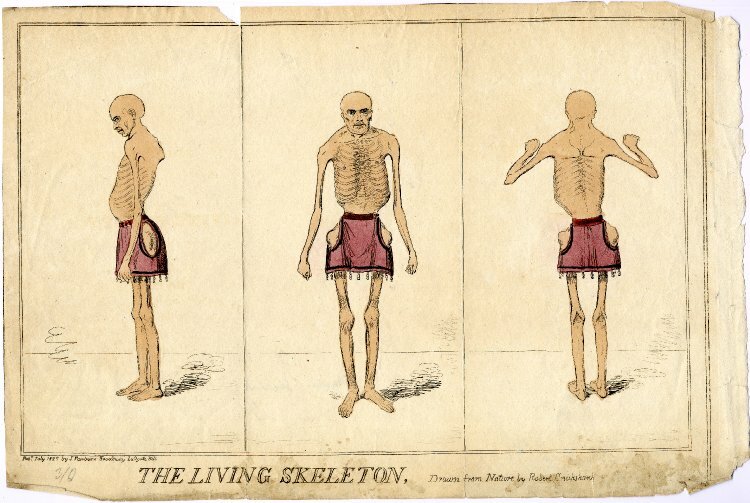 The Royal Urinead was the only one Hague’s pamphlets to feature any form of illustration. The impetus for this presumably came from his publisher William Horseman, who was responsible for producing at least one other satirical pamphlet on the Mary Ann Clarke affair with a similar frontispiece plate . 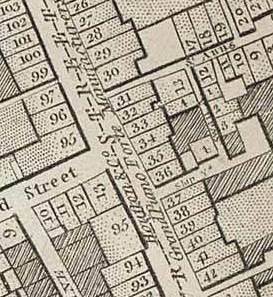 Very little is known about the nature of Horseman’s business, only that he occupied premises located in a dingy maze of back-alleys and courts between the western end of Oxford Street and the bottom of Tottenham Court Road, and that he seems to have been a printer by background. 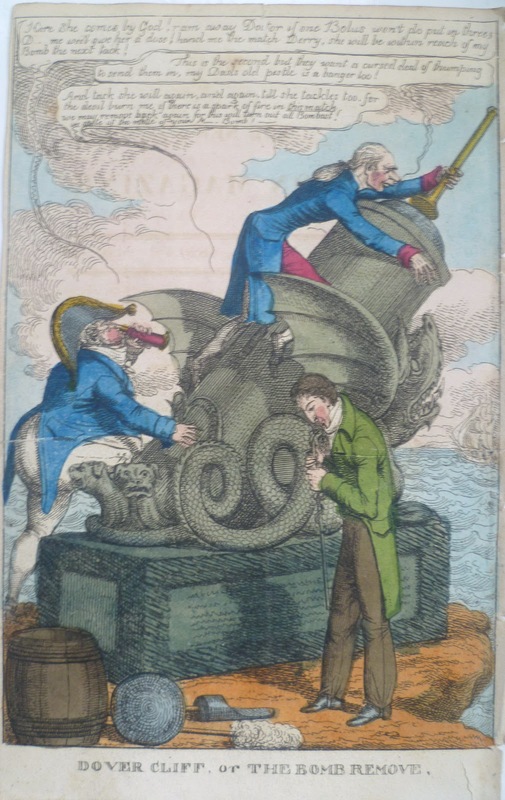 His involvement in the publication of satirical pamphlets and prints seems to have commenced suddenly in 1808 and been largely (if not entirely) occupied by the works of Thomas Hague. This hints at the possibility of the relationship being motivated by something more than business and that the two men were in fact friends and creative collaborators. 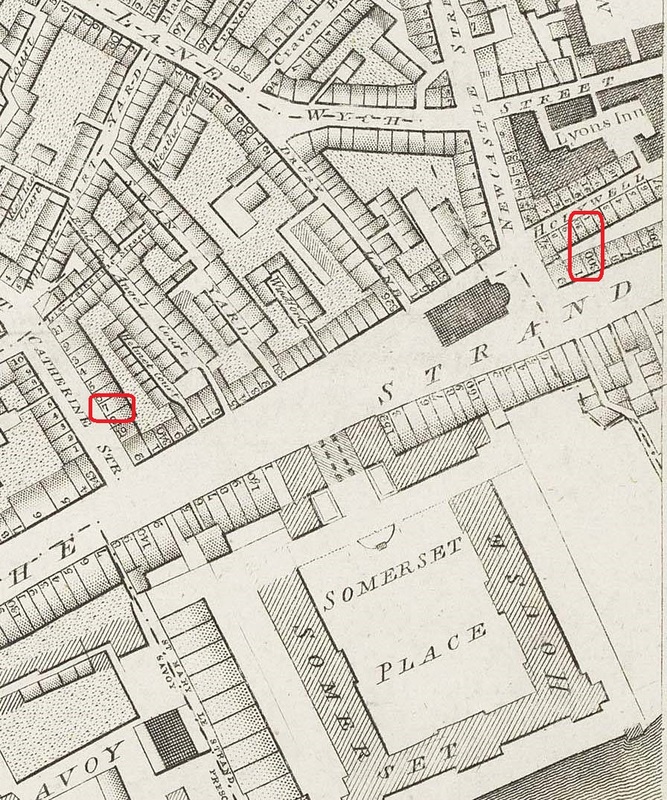 Indeed when a handbill attacking the Duke of Sussex and bearing Hague’s name was pasted up all over London in January 1809, the authorities struck against Horseman on the basis of evidence which suggested that it was he who “appeared to be the principle and to have influenced Hague…” . The caricature itself shows Queen Charlotte and her daughters gathered around a giant urn in which they are brewing some kind of tincture or tonic. The four princesses make various complementary remarks on the “pure and subtle” scent emerging from within, while pondering on the health-giving effects that the contents will undoubtedly have once drunk. The viewer however, having read the title of the print and the accompanying rhyme, knows that the royal ladies are actually about to consume a giant steaming pot of piss. This is confirmed by the presence of the Duke of Sussex, who peeks into the room from the door on the right to confirm that he is responsible for performing an “ablution” in the urn, and by the anger of the Queen who calls him a “nasty dog”. 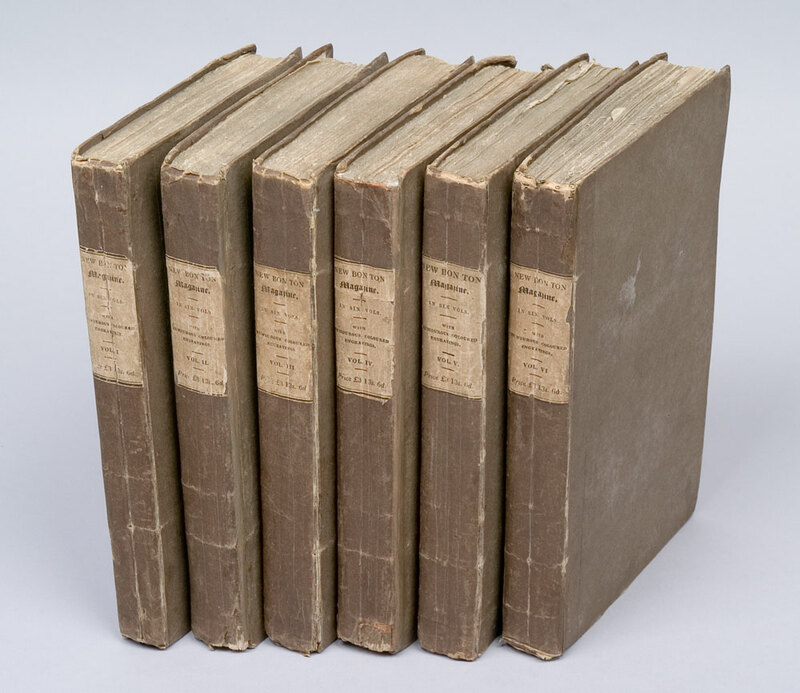 Only a handful of copies of The Royal Urinead are known to exist in the UK and North America. Examples of it appearing for sale on the open market are exceptionally rare, with the last recorded instance coming from an auction in New York in 1942. 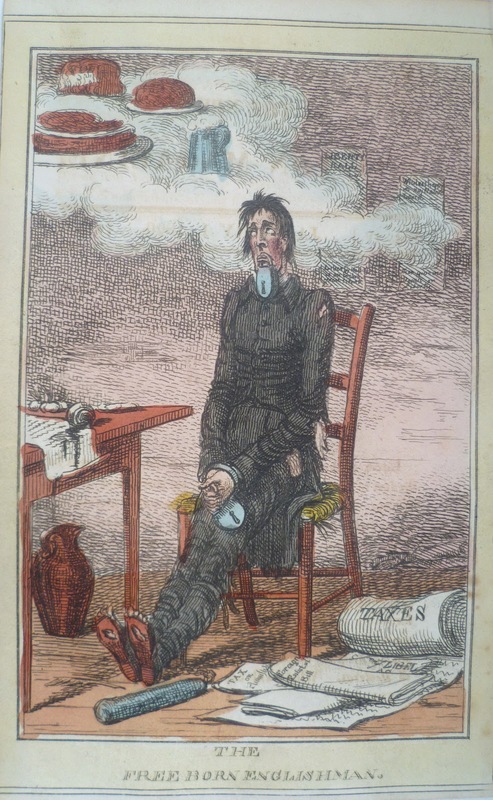 The print shown here was taken from a copy that went under the hammer in London last week where it fetched an impressive £550, which is far more than one would normally expect to pay for other examples of work by either Thomas Hague or Robert Cruikshank. 1. 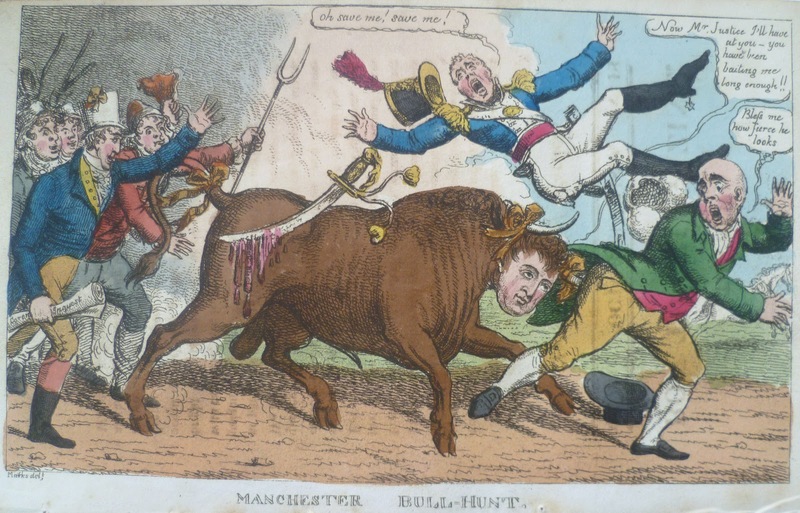 The print in question was Charles Williams, He ‘cannot’ go to Spain, or Canning’s death blow and it appeared as the frontispiece to Epistle to a Lady, published by Horseman in September 1808. Although the author is not identified, the subject matter and the inclusion of a dedication to the earlier works of Hague strongly suggests that he may have collaborated in its composition. 2. E. Holt, The Public and Domestic Life of His Late Most Gracious Majesty George III, Vol. I, (1820) p. 290.